I trained as a Nutritional therapist well over fifteen years ago and as a life long foodie have always ‘practised what I preach’. I knew that what we ate and drank has a huge effect on our mental and ‘soul’ health as well as our bodies but it wasn’t until about 5 years ago that I really truly deeply felt the truth of that saying ‘we are what we eat’. Five years ago I had a spell of reactive depression, anxiety and panic attacks following my husband’s death two years earlier. As I sunk under waves of horribleness and prodded along by caring friends and colleagues I managed to remember that paying extra attention to what I was eating and drinking could make a whole lot of difference. Of course it was true, although it didn’t ‘cure’ me, immediately I felt noticeably calmer, less anxious and more positive and active, this had a cumulative effect and as each week went by I felt noticeably better. I will tell you how I changed what I ate in just a minute but first a few background facts about the brain to help you understand why what we eat and drink is so important to how we feel. • 2/3 of the brain is made up of fat. The ‘healthy’ fat Omega 3 is particularly important for brain health; these good fats are also the fundamental ingredient in all the hormones and ‘feel good’ chemicals our body produces. • 1/3 of the brain is water, everything that happens in the body occurs within this medium so hydration is key to all health and well being. • The brain needs a constant source of energy for it to function efficiently and keep your mood stable and positive. While our bodies can ‘pootle’ along fairly happily running low on fuel, our brains are far more sensitive. • The brain needs a diet rich in micro-nutrients to facilitate the trillions of chemical reactions that happen every second, all of these nutrients come directly from our diet or rely on good quality food to provide the ingredients. So now you know the background this is what I tried to do everyday and I do mean ‘tried’, I remember how hard it was to do even small things when I felt rubbish!...but every little thing can help. 1. I ate plenty of good fats, particularly from foods rich in omega 3: • I tried to eat oily fish such as sardines, mackerel and salmon 2-3 times a week. • For a snack or lunch I would mash an avocado and have on rye toast or in a baked potato or blend into a smoothie. • I snacked on unsalted nuts and seeds and ground them and sprinkled them on salads, soups, porridge and muesli. Flax seeds are very high in omega 3, these needs grinding or soaking before eating as they have a very dense shell. 2. I drank plenty of water so I was as hydrated as possible, and I avoided drinks that dehydrated me such as tea, coffee, alcohol and sugary drinks. I particularly found alcohol would leave me feeling anxious once the relaxing phase had passed, so it was bye-bye alcohol for a little while. I know 2 litres of water sounds a lot but spread over a whole day it’s definitely achievable. Personally I don’t like cold water, unless I’m exercising so I always have warm water with a slice of lemon, for me this became my new ‘cuppa’ and I now love it! • I would combine these choices with proteins such as nuts and seeds, fish, lentils, beans, lean meat, eggs and tofu. By doing this I was stabilising the natural fluctuation that happens when we eat any carbohydrates. • I avoided eating foods that give a quick burst of energy. These include sweets, chocolate, sugary breakfast cereal and ‘white’ grain products such as white pasta, bread and rice. I really really noticed that processed sugary foods would affect my anxiety level big time. • Avoid brain clogging ‘nasties’ such as over cooked and over processed foods. On a bad day I would only manage to do one of the four suggestions (usually drinking water), on a great day I did them all for at least one meal and I always tried to pat myself on the back that I was doing something to help myself however small. So that is how I ‘felt’ (I had already learnt!) first hand the power of food to change how we feel. 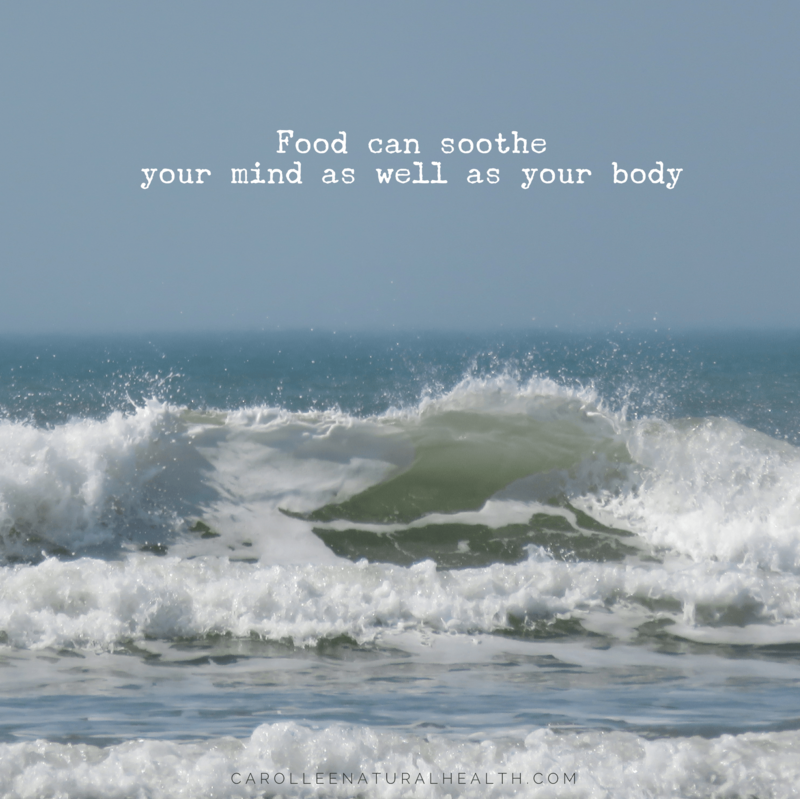 Thankfully with the help of my ‘mood food’ way of eating, a supportive therapist and my regular Acupuncture I got through my ‘annus horribilis’ and have never looked back, I sometimes gets echoes of anxiety and I always just tighten up my diet for a couple of days and it passes again.